Linden is known throughout the Northern Hemisphere for its beauty and sweet-smelling flowers, which possess the ability to ease anxiety and despondency. The linden tree, also known as basswood tree, is indigenous to several regions of Europe and Asia, and it has successfully adapted to North America. From the old-growth forests of Europe to distant continental shores, the linden tree has provided shade and beauty for centuries. However, humans have also used linden flowers, leaves, and wood for medicinal purposes since Medieval times. Treating insomnia. 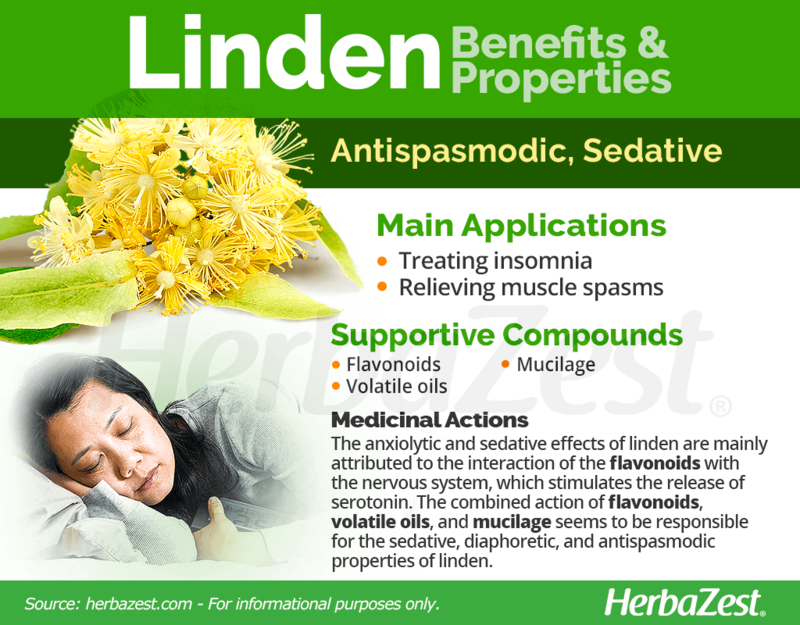 Linden properties include anxiolytic and sedative effects, which are useful for treating many sleep disorders, including insomnia. Relieving muscle spasms. Linden works as an antispasmodic agent, which can help relieve muscle cramps or spasms, especially in arms and legs. Soothing airways. Linden can help clear airways in congested sinuses. Aid in digestion. Linden can help with numerous digestive functions, including relieving indigestion. Anti-wrinkle. Linden has properties that promote skin elasticity, which reduces the appearance of wrinkles on the skin. 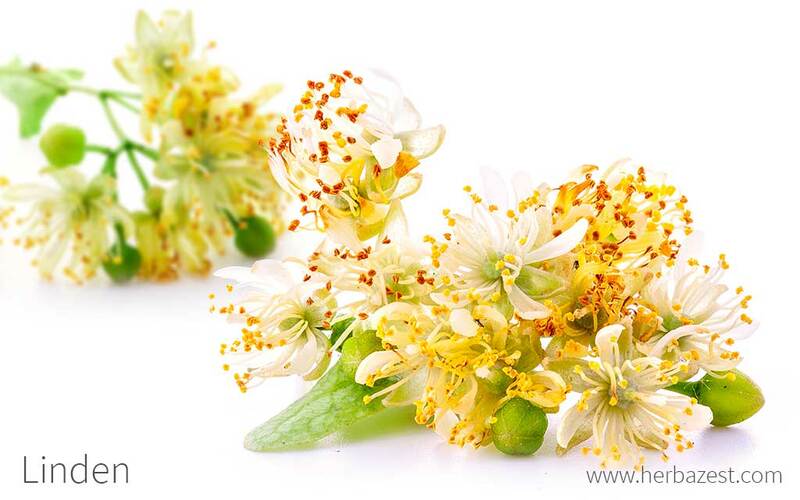 Linden flower contains high concentrations of medicinal compounds, mainly flavonoids, like quercitin, rutin, kaempferol, and p-Coumaric acid, as well as volatile oils and mucilage. The combined action of these compounds seems to be responsible for the sedative, diaphoretic, and antispasmodic properties of linden. 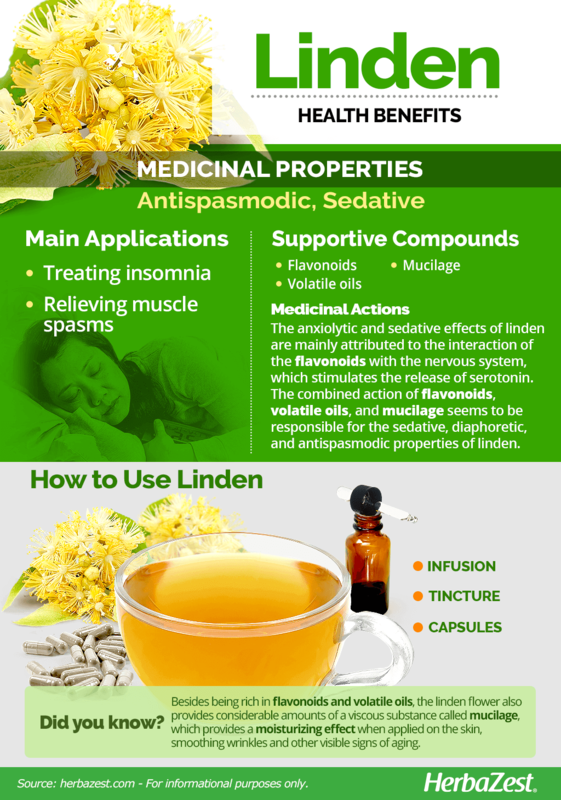 In preliminary studies, the anxiolytic and sedative effects of linden have proven to be similar to those of diazepam, mainly attributed to the interaction of the flavonoids with the nervous system, which stimulates the release of serotonin, a neurotransmitter that has been associated with a number of cognitive disorders, including depression, bipolar disorder and schizophrenia. Other compounds associated to the sedative effects of linden flowers are volatile oils, mainly citral, citronellal, eugenol, and limonene. The linden flower also provides considerable amounts of a viscous substance called mucilage. Roughly half of the mucilage in linden is composed by uronic acid, from which glucuronid acid, a skin-conditioning agent, can be obtained. When applied on the skin, linden's mucilage provides a moisturizing effect, smoothing wrinkles and other visible signs of aging. Other herbs with sedative effects are lemon balm and lavender, whereas guelder rose and rosemary can help relieve muscle cramps. Linden is likely safe for most people when taken orally. However, it can cause mild skin irritation when applied topically. Excessive use of linden has been linked to heart damage, so those who suffer from heart disease, as well as women who are pregnant or breastfeeding, should not consume it. Likewise, children should not use linden medicinally without medical supervision. The most effective way of obtaining linden's health benefits is in its medicinal forms, where the properties are more concentrated. Infusions. One of the most popular medicinal forms, linden infusions have long been used for treating insomnia, due to its sedative properties. Linden hot teas have also been used soothe airways. Tinctures. 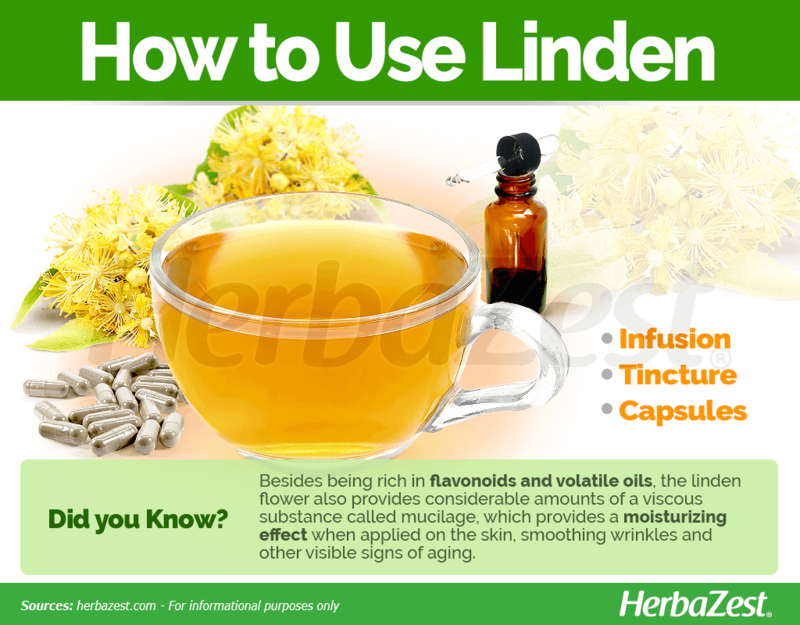 A linden tincture can relieve muscle spasms, thanks to its antispasmodic properties. It can also promote better quality sleep with its sedative properties and aid in digestion. Capsules. In its most concentrated medicinal form, linden capsules can relieve muscle spasms because of its antispasmodic properties, as well as aid in digestion. If linden trees are native to an individual's place of residence, buying linden may be rendered unnecessary by a walk around the neighborhood. For others, linden trees can be found at many garden stores and nurseries that carry large flora. Linden's dried leaves and flowers are available in specialized health stores and most supermarkets, both in bulk and tea bags. Online retailers are great for getting linden remedial forms and supplements to consumers who live outside native regions. Beloved for its low-maintenance upkeep, the linden tree, also known as basswood tree, American basswood, among other common names, is a deciduous species that can grow up to 80-100 feet (24-30 m) tall and spread about 40 feet (12 m) wide. It is a great shade tree to have in open landscapes or residential streets. The linden tree grows best if given full sun and rich, moist, well-drained soil. However, they tolerate light shade, as well as clay soils, a wide pH range, and heat. The linden tree is mainly propagated by seed, but other methods include cuttings, layering, or grafting. The best time to collect linden seeds is Autumn. They must be kept in a cool and moist environment for 90 days, to ensure a successful germination after being sown in Summer. The proper temperature for seeds' germination is 85°F (29°C) during the day and 65°F (18°C) at night. In June, the linden tree produces abundant, two to three-inch (5 - 7.6 cm) wide clusters of very fragrant, light yellow blooms, which are extremely attractive to bees. The small, grey nut which is later produced will persist on the tree until midwinter. It is important not to plant the seed too deeply and to transplant saplings when necessary so that each has enough space for root expansion. While it is a slow-growing tree, linden trees can grow up to 130 feet (39 m), with average heights around 80-100 feet (24-30 m) tall. Linden leaves are heart-shaped and asymmetrical. The tree produces beautiful, fragrant yellow flowers that appear in the summer and attract bees. Linden is a member of the Tiliaceae family, a botanical group composed by trees, shrubs, or rarely herbs, comprising about 450 species across 50 genera. There are roughly 30 species in the Tilia genus, but the most widespread species are the small-leaved linden (Tilia cordata) the large-leaved lime (Tilia platyphyllos), and the common lime (Tilia europaea or Tilia vulgaris), all typical of Central Europe and the British Isles, whereas the native American linden tree (Tilia americana), also known as basswood tree, can be found across North America. Asian species (such as Tilia chinensis and Tilia japonica, among others) are significantly more diverse, and they are used relatively interchangeably for the same ornamental and health benefits. The Vikings used its wood to make battle shields, and during the 17th and 18th centuries, it was also used in landscape planning to form European avenues. It also boasts a long history of use in herbal medicine to treat respiratory problems, and medieval altars were sometimes carved from its beautiful white wood. Linden products remain in high demand today, as millions of tons of its herbal tea are exported from China each year and continue in popular use through alternative medicinal methods. Honey made from its flowers is a popular sweetener exported from central Europe, and recent years have seen the European Linden increasingly introduced across the Atlantic to replace its American counterpart, which experts are predicting to be 42% less suitable for planting by the year 2050. Centuries ago, hunters used to follow bees back to their hives after the bees sucked the nectar from linden blossoms. Once the bees were in the hives,hunters would gather the honey from there, believing that linden blossoms made for the best honey. Both the Czech and Slovak Republics have claimed it as their national tree, and Slovenia continues the European tradition of political meetingsbeneath its largest specimen. In Berlin, linden trees are considered one of the city's emblems, and its presence gives name to the city's most famous avenue, Unter den Linden. Ornamental. Linden'shistory as an ornamental tree dates back hundreds of years, and still asymbol of the ancient European woodland. One-third of the streets of Berlin are lined with its beauty. Timber.American types of linden were long used for timber, though the practicehas ceased in modern times. However, its soft wood that can be easily manipulated. Musical instruments. Because of how soft of a wood linden is, it is an ideal material for manufacturing electric guitars, bass guitars, and different wind instruments. USDA Plants Database, Tilia americana L.